I thought I’ve seen every jaw-dropping wonder in Cebu. Years of being a weekend warrior, exploring the island’s remote regions, made me believe that I’ve seen my homeland’s finest. But, I was wrong. And, ironically, I felt glad, blissful and relieved, when I realized my assumptions were untrue. 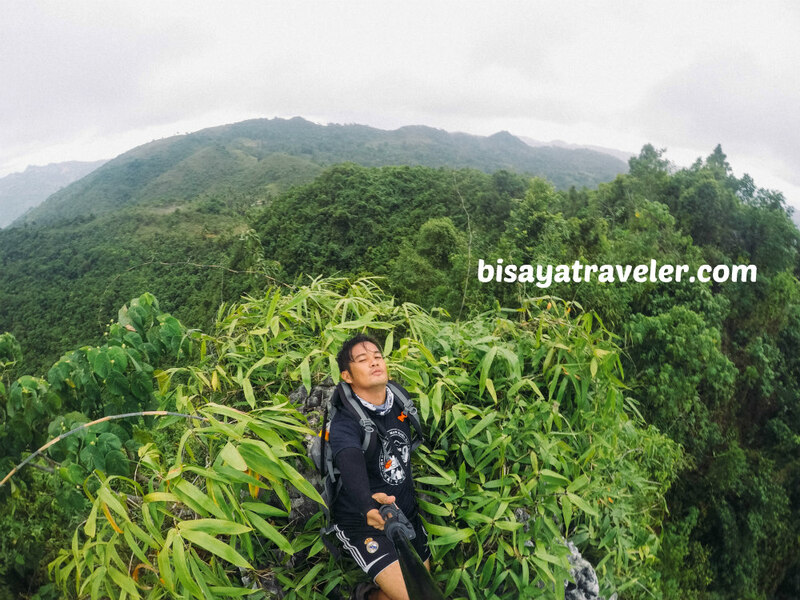 After soaking up the panorama on Lantawan Cliff, I found out that I’m still scratching the surface, when it comes to discovering Cebu’s hidden gems. Inspired and even more motivated, I’m now so pumped up and ready to uncover the rest that my adventure playground has to offer. Heading into our hike to Lantawan Cliff, I thought our Sunday escapade would be a chill hike. 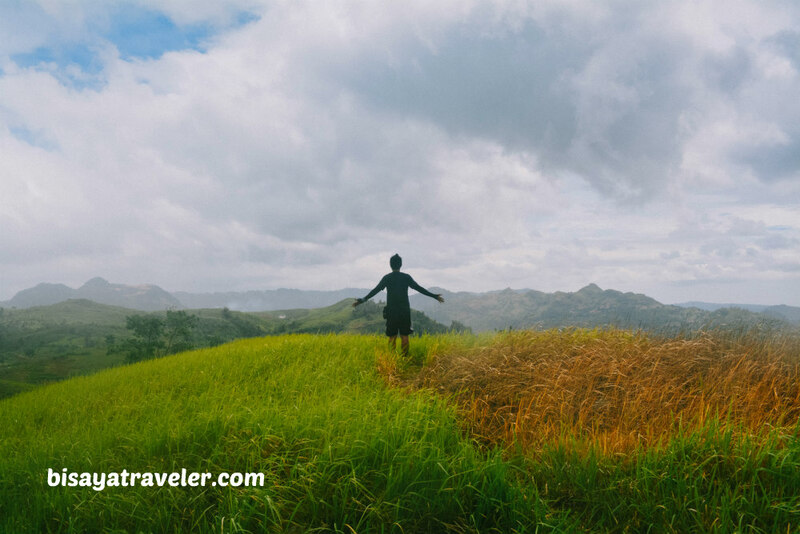 After all, the highlands of Naga, Cebu are known for its rolling hills, verdant landscapes and picture-perfect sights. Much to my delight, the climb up to Lantawan Cliff was, in a fairly positive way, a struggle and a challenge. 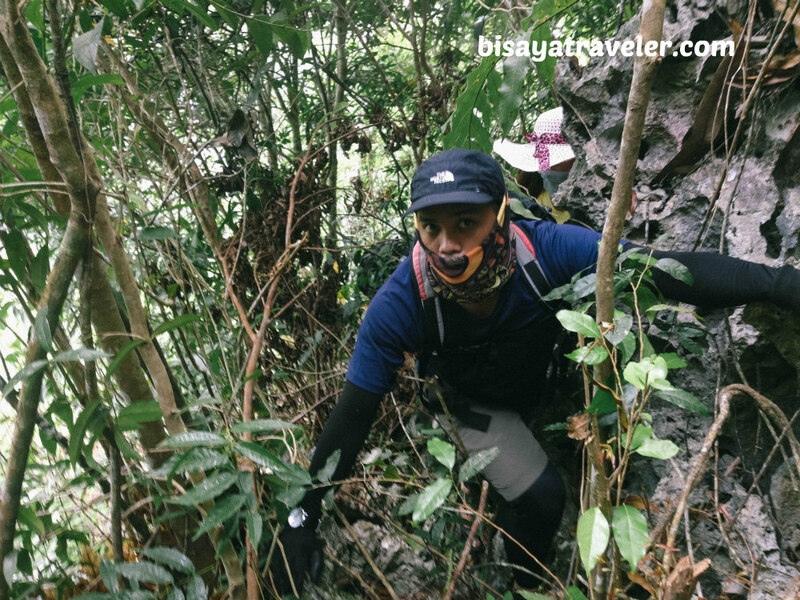 From its thick and bushy trails to its sharp limestone crags and loose rocks, it was truly a blast and a one-of-kind adventure that spiced up my weekend. My fun-filled weekend adventure started with a quick meet-up at Cebu City South Bus Terminal, with Raul, Beboi, James Glendon and RJ. From there, we took a bus ride to Balirong, Naga where we caught up with the rest of the gang – sir Francis, Beth and ma’am Fe. Of course, the Naga girls – Maricar, Geneva and Rona – were also around to join my climb up to Lantawan Cliff. 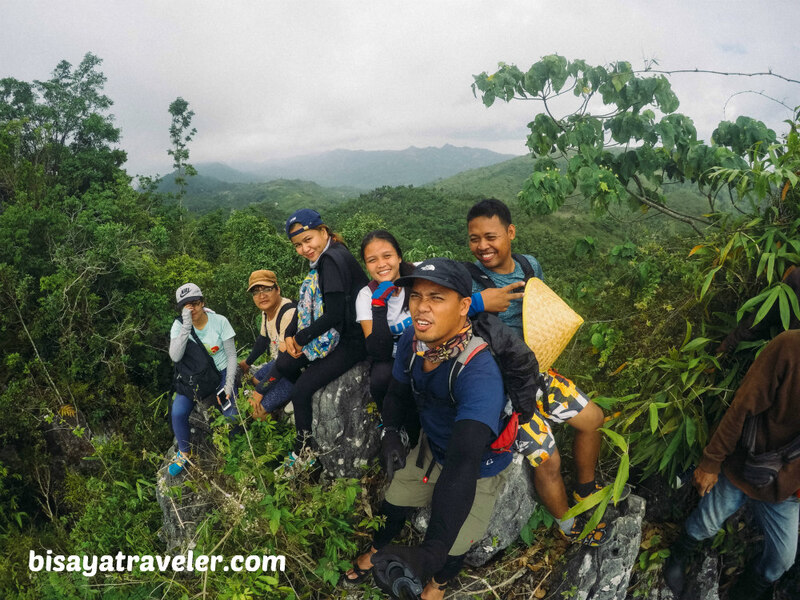 With everyone geared up and ready for the hike, we wasted no time, and hit the road leading to the first stop of our day hike – Panas or aptly nicknamed as “Balirong Peak”. Along the way, we made a few stops, to take a breather and savor the views. As always, we also said a prayer, in one of our breaks, led by the quirky Tatay Wanderer – Raul. 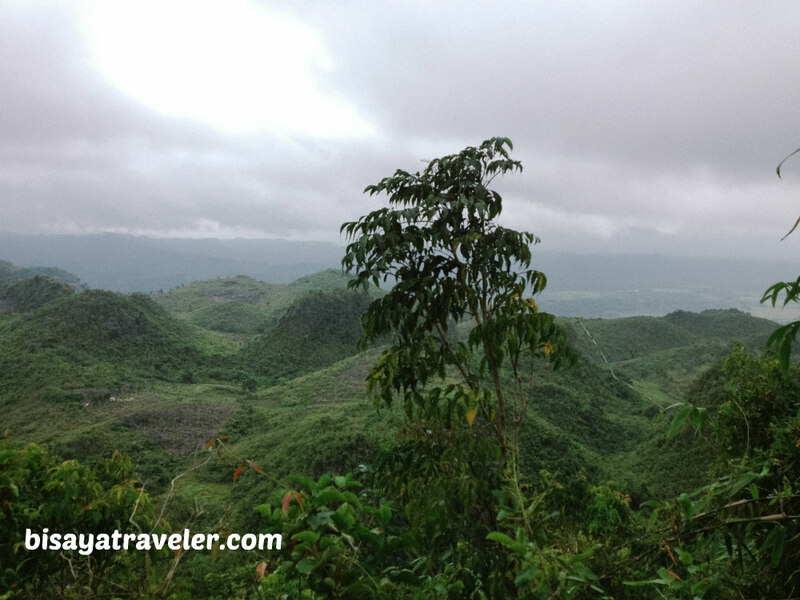 With a lighter load and favorable weather, we arrived at Balirong Peak so much earlier than we expected. So, we spent some time on the peak, chilling, taking in the fresh mountain air and snapping photographs. 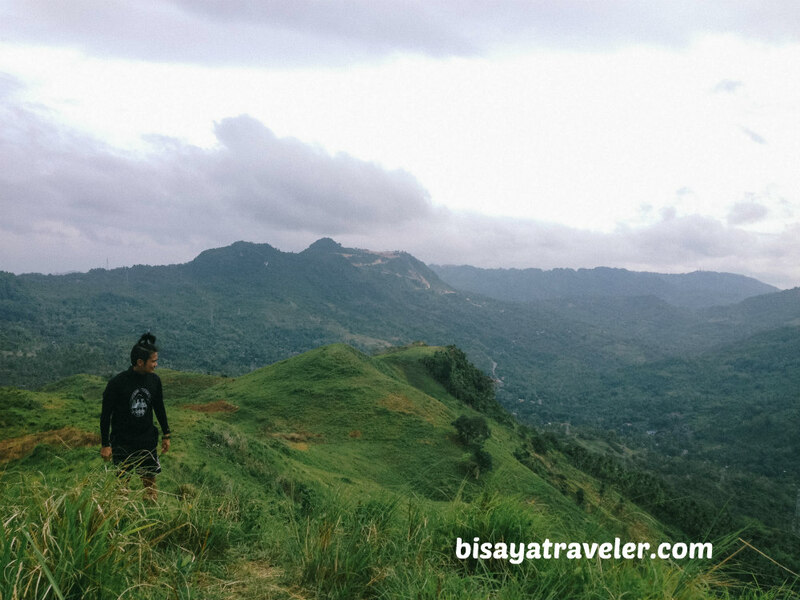 Although it’s my second time to visit Panas, I was still astonished and swept away by the sheer beauty of this relatively unknown mountain in Naga, Cebu. 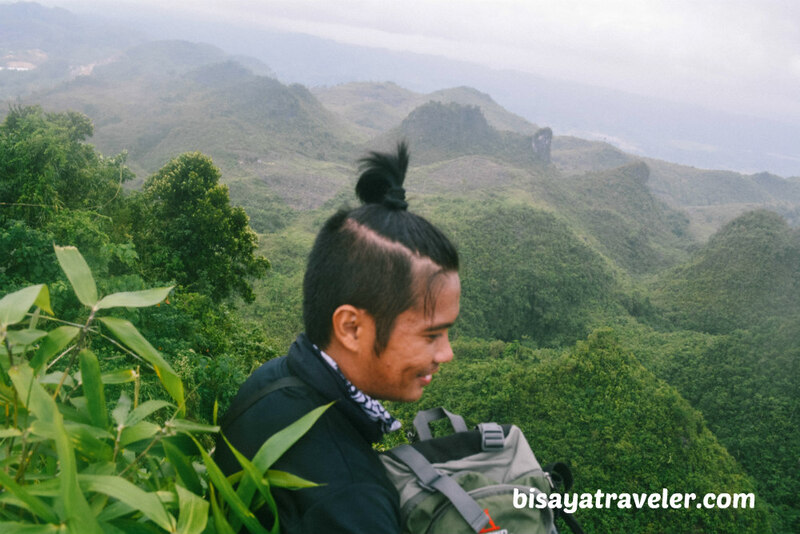 Even Beboi was amazed by the soothing atmosphere and mesmerizing scenery of Balirong Peak. 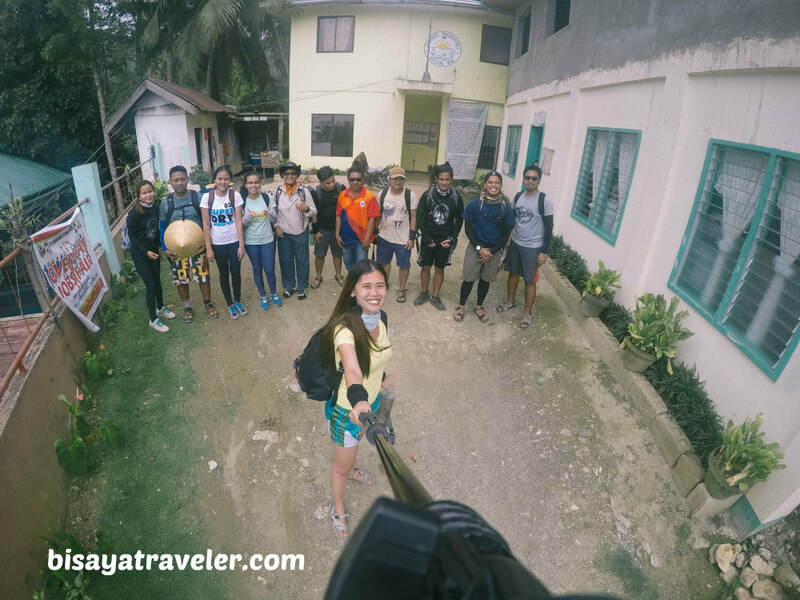 Obviously, we couldn’t resist the urge to take dozens of solo shots and group pictures on this remote area in Naga City. Once the pictorials were done, we hit the trail, passing by the road as well as th familiar picture-perfect, unheralded hills of Naga. As for our pacing, it was a little faster, compared to our first hiking trip in this side of Naga, thanks to the mild weather. Even though I haven’t been quite active lately, the pace was working to my favor, shocking my system and warming up my muscles for the tough climb ahead to Lanawan Cliff. We did, however, take quick 5-minute breaks, to rest our muscles and capture the beautiful natural backdrops through our cameras. As were hiking on the hilly regions, I could hear giggles and chuckles from folks on our tail end. And, guess what? I wasn’t surprised at all. Every time Raul and James combine forces, it’s bound to be an incredible and memorable laugh trip. From James Glendon’s witty “hugot” lines to Tatay Raul’s inhuman appetite, these hikers boast a deadly tandem with a unique arsenal and an endless array of jokes. In my book, these hiking enthusiasts can give the country’s top comedians a run for their money. Hopefully, one day, we’ll see these guys do some stand-up comedy somewhere in Cebu or in Manila. 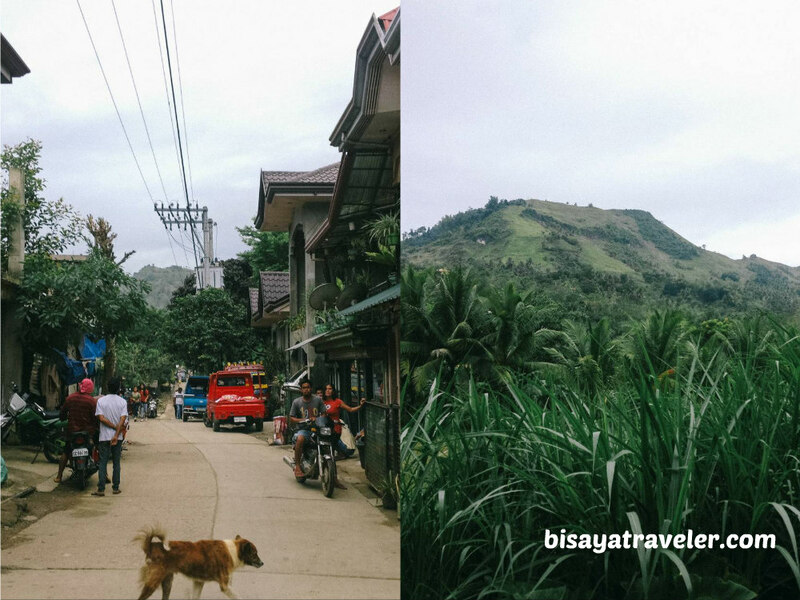 We kept on hiking and enjoying one another’s company, until we arrived at the main road leading to Tagjaguimit barangay hall. While our pace wasn’t exactly furious and the weather was perfectly fine, I did feel a bit tired on our way to Tagjaguimit barangay hall and Lantawan Cliff. Not only was my stomach grumbling, but it we were also walking on a concrete road, which did make my joints feel creaky. Moments later, we arrived at Tagjaguimit barangay hall, where we were welcomed warmly by captain Nanding and his charming associates. Since it was already lunchtime, we took a break in Tagjaguimit barangay hall, and indulged on a hearty smorgasbord of dishes and treats. 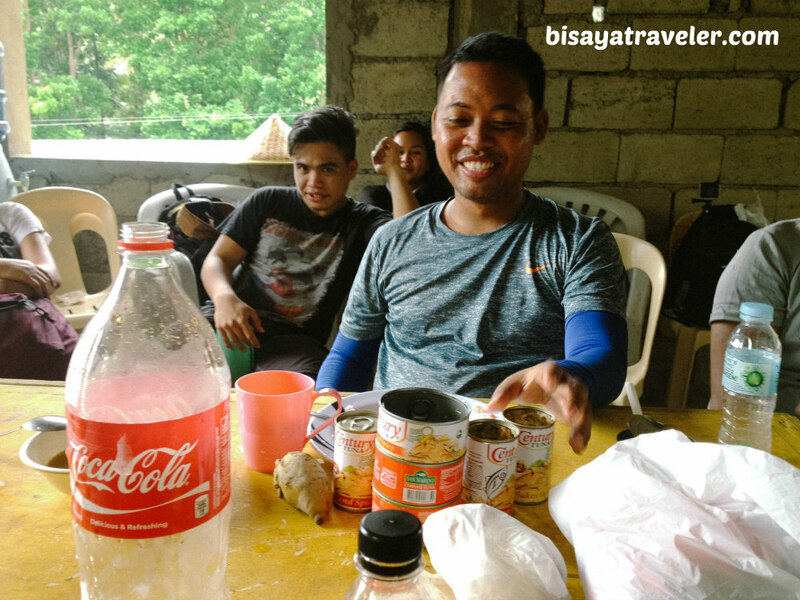 As with my recent day hikes with this crew, Tatay Raul was the uncontested headliner of our lunch break, wowing us with his extraordinary skills in eating. In the words of the old and wise Tatay Wanderer, he is, and will always be, the team’s ultimate food sweeper. And, yes, he did live up to his reputation during our Lantawan Cliff adventure. After our lunch break, we did some catching up in the barangay hall, talking about a lot of things, including Raul’s favorite hiking buddy and crush. Out of nowhere, Geneva revealed some juicy information about Raul’s infatuation to a fellow hiker. According to Geneva, Raul confessed something to her, when Raul was tipsy a week ago. And just like that, Raul tagged Geneva as his “best-friend”, hoping that she won’t show us the screenshot of their Facebook chat when Raul was drunk. Honestly, I don’t know what was the content of their convo, but I did notice that Raul was somewhat disoriented, following Geneva’s intriguing revelation. To me, only a screenshot of their chat would shed light on this mystery. Soon after, captain Nanding gave us a rundown of what to expect on our adventure to Lantawan Cliff. What’s more, he offered us a free ride, via the barangay’s official service, to the jump-off point of Lantawan Cliff. 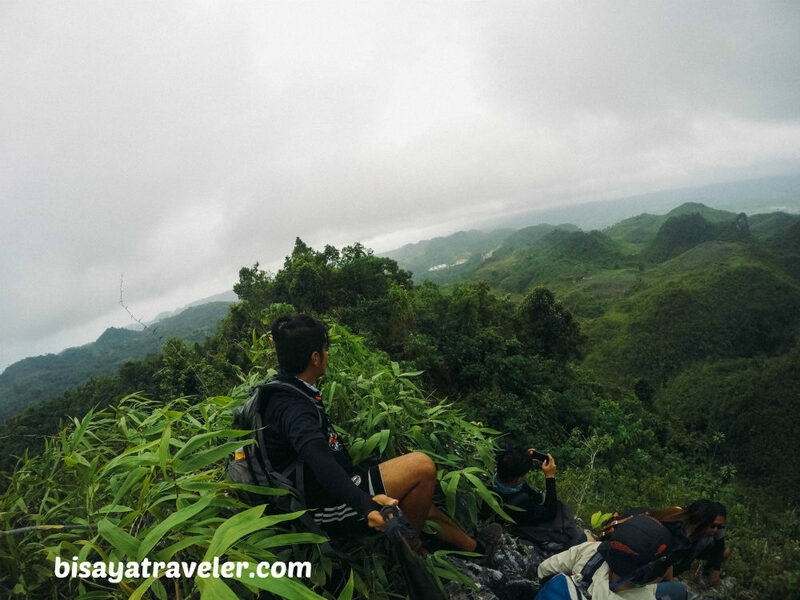 With our stomachs refilled and our spirits replenished, we packed our bags, and made preparations for our climb to Lantawan Cliff. 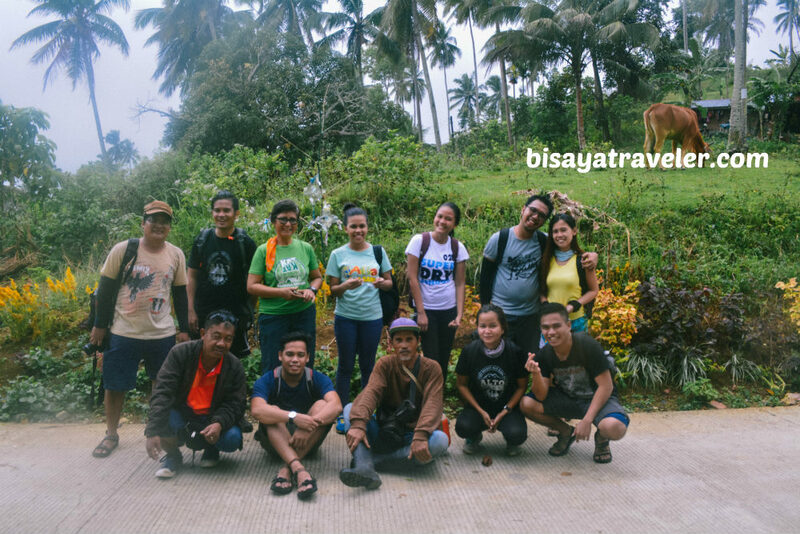 Before we embarked on our hike to Lantawan Cliff, though, we took a group photo in the barangay hall, together with captain Nanding. We, then, hopped on the barangay’s multi-cab, and went on a short ride to the jump-off point of Lantawan Cliff. 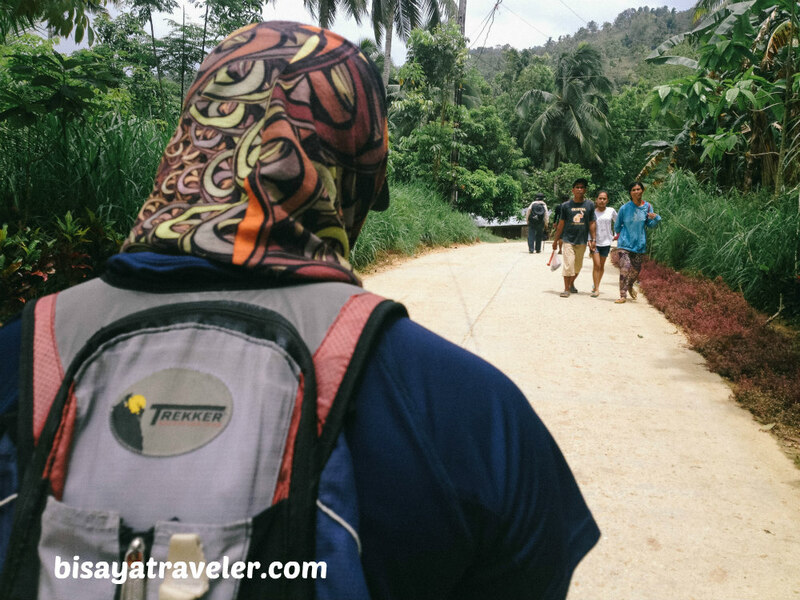 Upon our arrival, we followed the tanods and locals, to the trail leading to Lantawan Cliff. And, the real adventure to Lantawan Cliff officially began! At first, the trail to Lantawan Cliff seemed pretty easy and a breeze. And, truthfully, we barely had any trouble, passing by the no-so established trail and rocky obstacles. 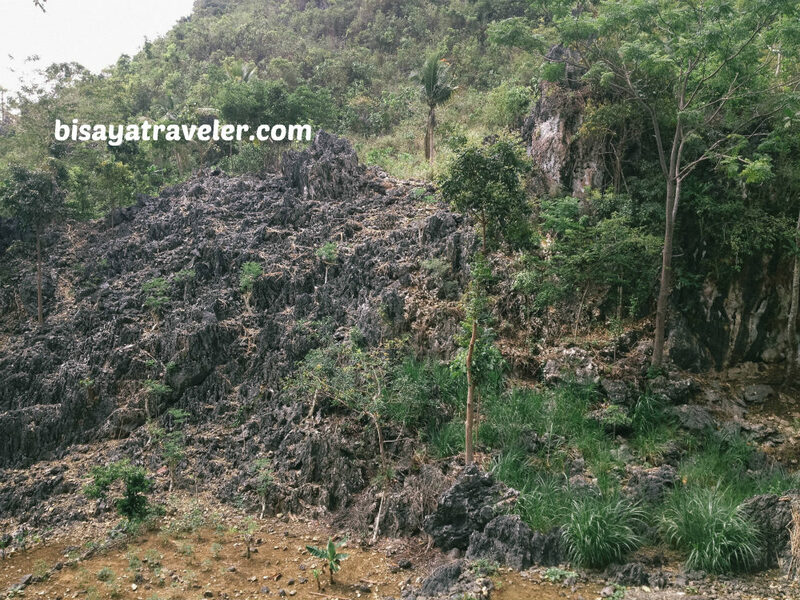 As we were hiking our way to the top of Lantawan Cliff, we caught a glimpse of these wondrous rocky formations. With its towering dark outcrops, this spot somewhat reminds sir Francis of the epic scenes of the well-known Lords of the Rings trilogy. 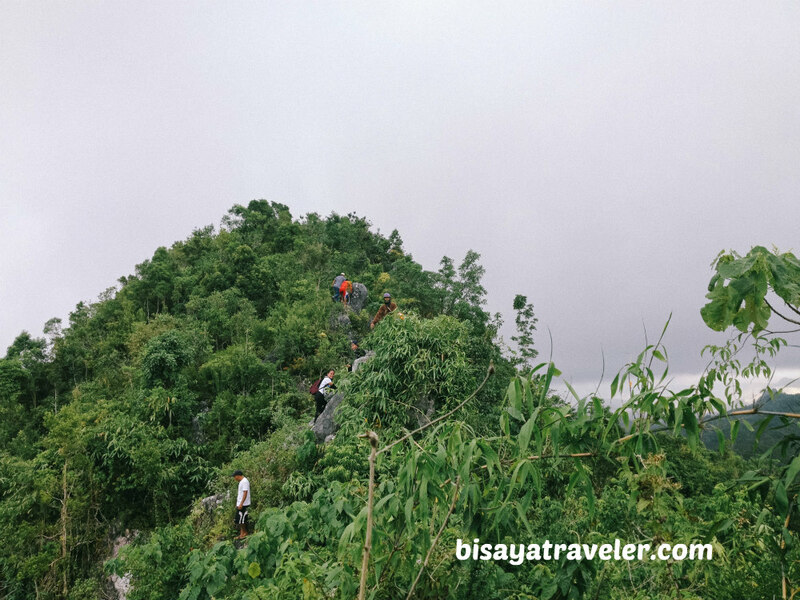 Eventually, however, the trail to Lantawan Cliff got steeper and more complicated. The trail was literally covered with twigs, roots and branches, meaning we had to crawl and dodge these hurdles. Oftentimes, we had to channel our inner acrobats, to climb and make our way out of the rugged parts of the pathway to Lantawan Cliff. And, there were tons of bees and nasty fire ants around too. As a matter of fact, Beboi had a nasty and painful fire ant bite on his hand. 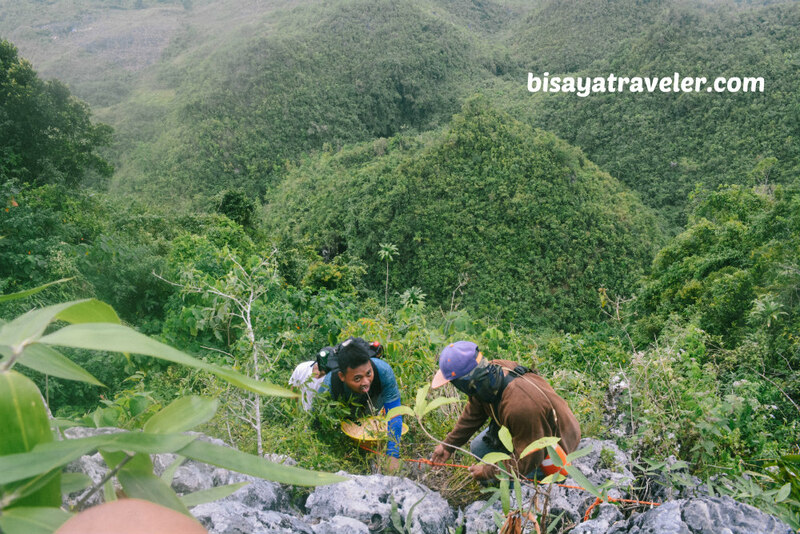 Armed with a katana-like sword, the tanods and barangay officials did their best to make our climb to Lantawan Cliff as smooth-sailing as possible. Still, it wasn’t enough, especially since Lantawan Cliff hasn’t been explored by anyone for years. But, it was totally fine to us! Amazingly, we were having a swell time on these rough spots. As far as I’m concerned, it was the perfect drug to our incurable case of wanderlust. And, take note, we also craved for these kinds of hikes and adventures. 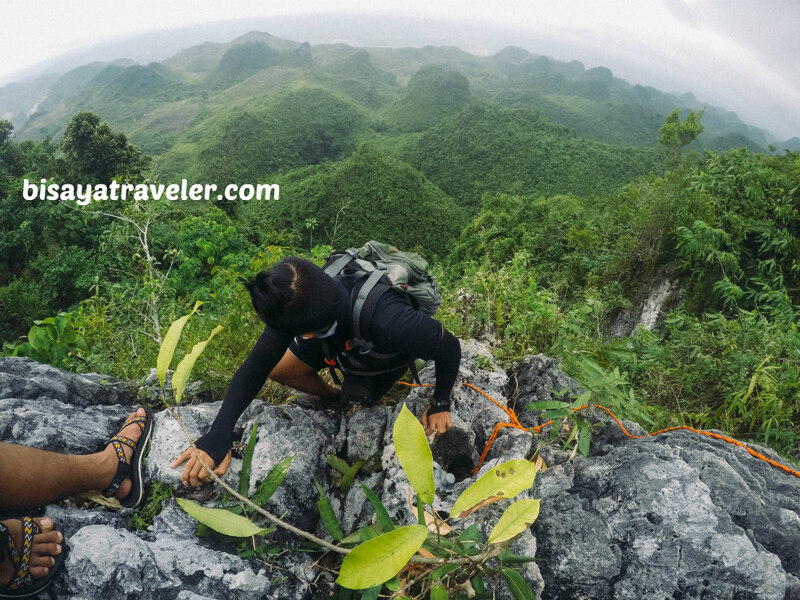 With our innate adventurous spirit, we enthusiastically faced all the hurdles along the way, and embraced the tough challenge leading to Lantawan Cliff. 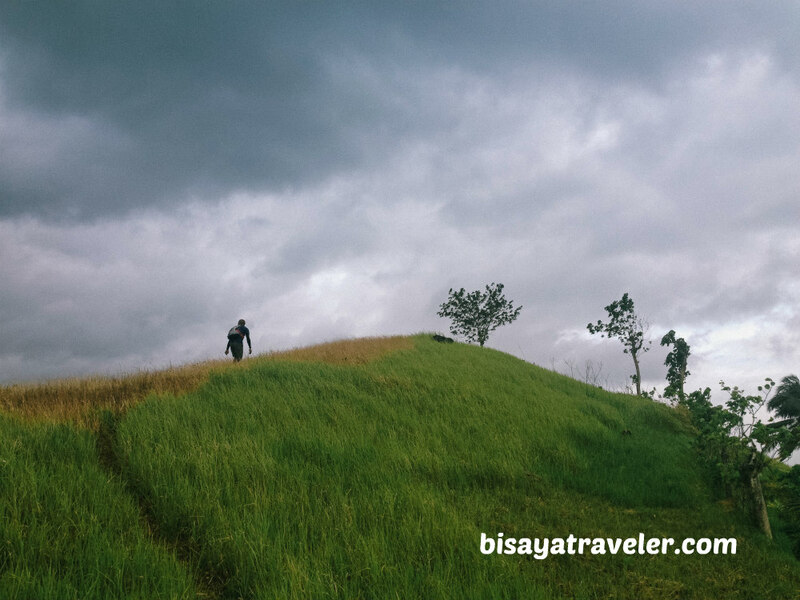 And, in some ways, it reminds me of our treacherous hike up to the highest peak in Eastern Visayas – Alto Peak. 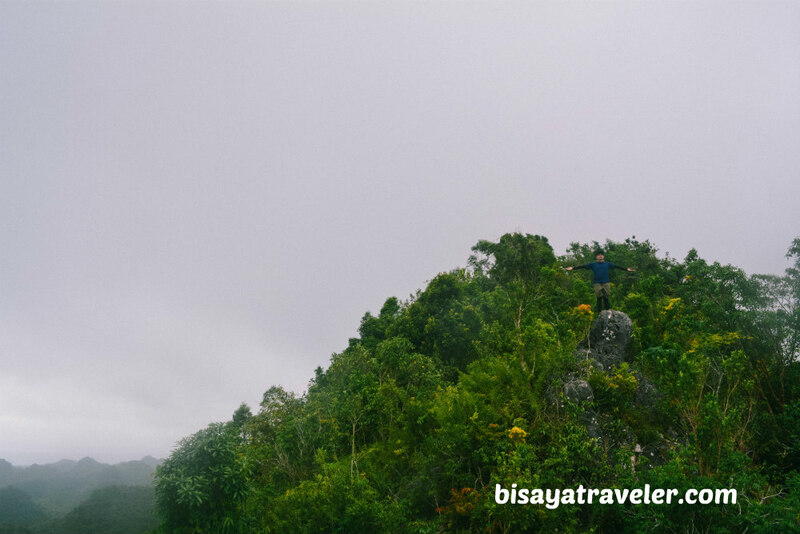 On our way to the top of Lantawan Cliff, we got a sweet breathtaking view of an impressive monolith as well as the untouched mountains in Naga, San Fernando and Lamac. 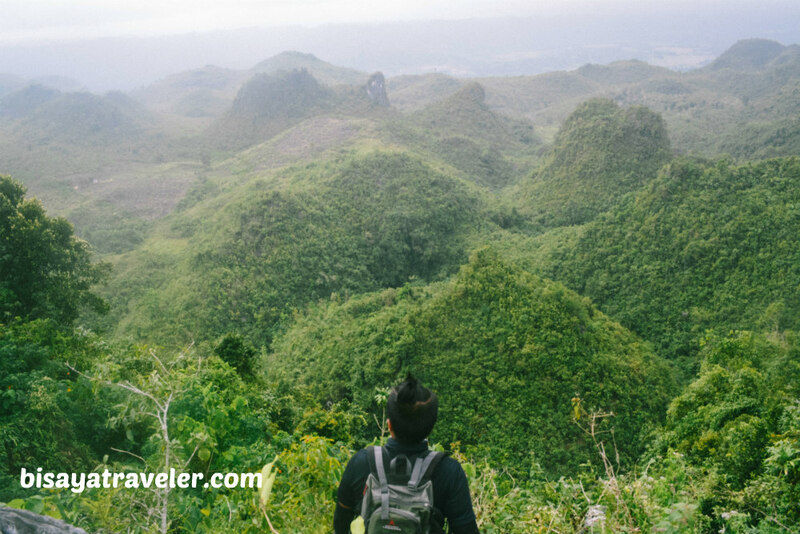 With its verdant hills and picturesque mountains, this natural backdrop looks a lot like the iconic views from Lugsangan Casino Peak. Minutes later, we went on with our climb, until we arrived at arguably the most complicated part of our climb. “Damn, this is going to be a hell of a climb”, I said to myself when I saw my buddies scrambling on the rocks of Lantawan Cliff afar. Even though they still exuded a positive vibe, my senses were telling me that they were a bit scared of the climb. And so, I took on the challenge, unleashed my inner rock climber, and conquered the towering rock with flying colors. Later on, the rest of the gang joined us, on the peak, climbing on the rocky part of Lantawan Cliff. Using our ropes as a hand guide, we all managed to get to this part of the mountain. 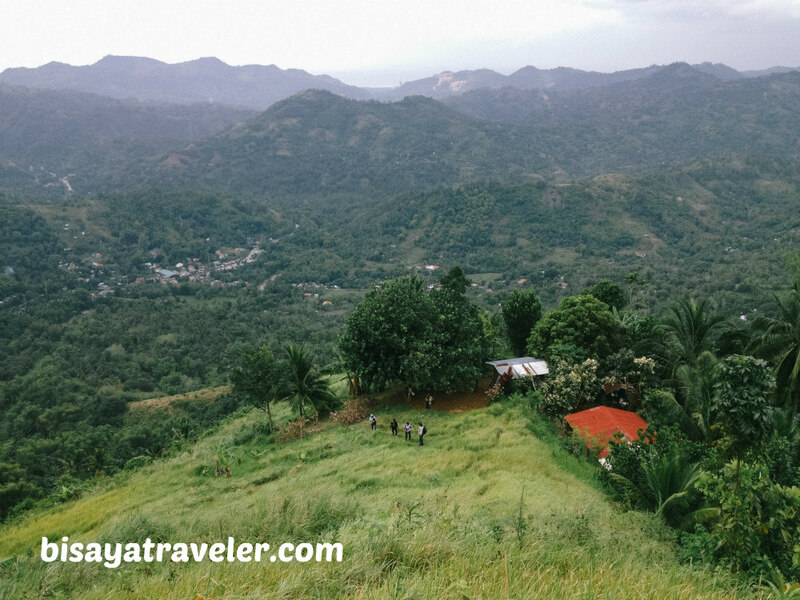 As far as the view goes, it was absolutely nothing short of amazing, and arguably one of the best in Cebu. When it comes to attractions in Cebu, I’ve never seen anything like it, thus far. In my book, the scenery of Lantawan Cliff is unique, with shades of Dalaguete and Balamban. If Casino Peak and Mount Mauyog had a child, it would look like Lantawan Cliff. Despite my precarious position, I did have a fun admiring the splendor from this bizarrely wonderful rock. And, with Rj’s GoPro, we snapped a myriad of shots from this awesome vantage point. And, there were tons of buhis-buway-like shots too. We did spend a ton of time, there, just enjoying the vista, while the tanods were preparing and clearing our way to the summit. As for Raul, he was unusually quiet, sitting close to his new best-friend. Whether it was because he was scared of the heights or of Geneva’s revelation, he wasn’t himself on this part of our climb to Lantawan Cliff. But as Raul has said to me earlier, his IQ and upbeat spirit go down a notch, as the elevation goes higher. 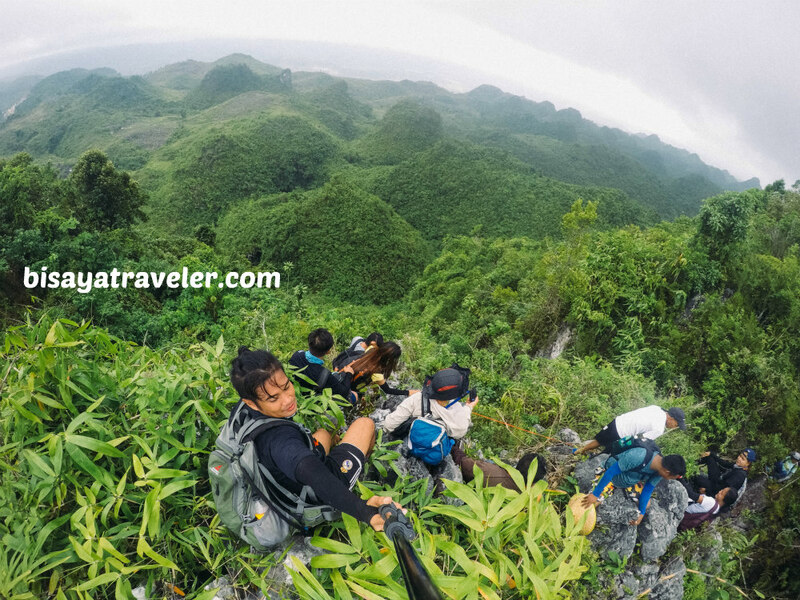 Unfortunately, the tanods told us and cap that it’s not ideal to get to the summit of Lantawan Cliff, with the area fully covered with trees, tall grass and plants. “You can’t see any beautiful view from here”, said one of the tanods. We’re an obedient bunch, so we heeded their tips and descended from the high parts of Lantawan Cliff. Plus, the sky was turning gray as well, with intermittent raindrops and howling winds. 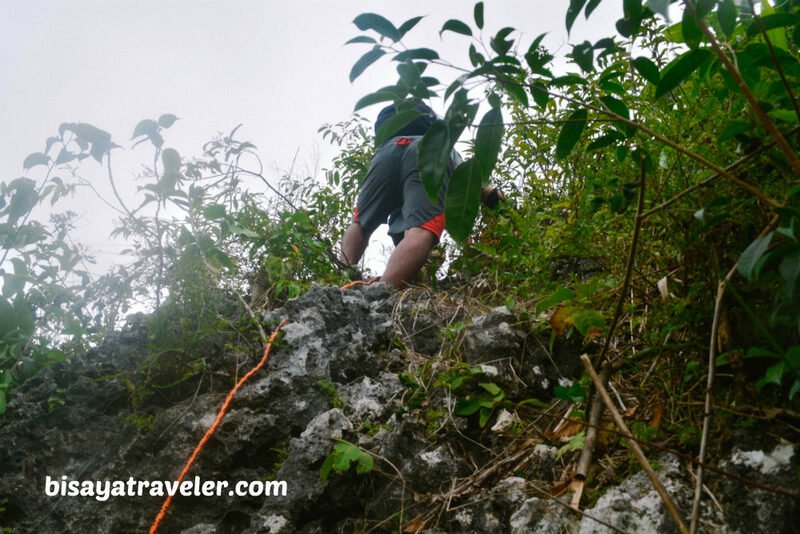 Although we didn’t exactly get to the top, we were still on a state of euphoria during our Lantawan Cliff adventure. 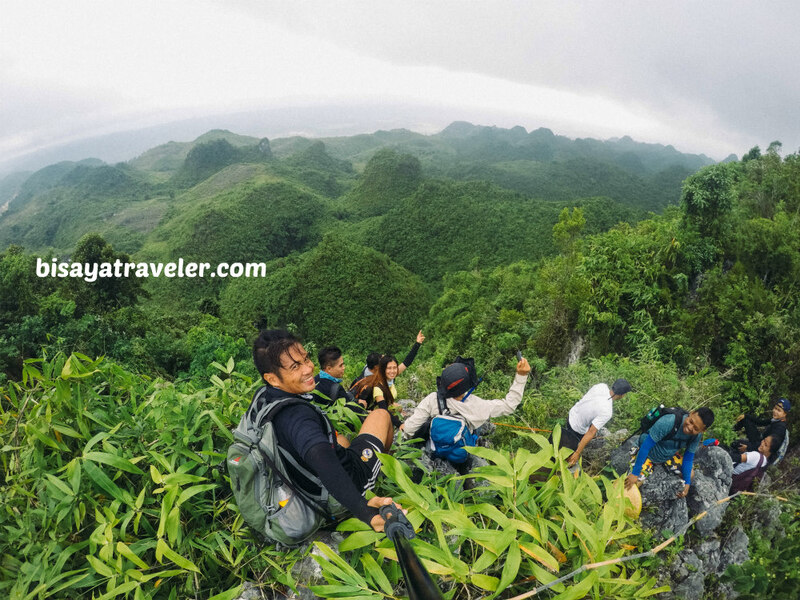 With its fresh mountain air and striking bird’s eye view, it was, hands down, one of my exciting climbs in Cebu, this year. And besides, we are, in the near future, going to visit Tagjaguimit again, to explore its other gems. We got lost, on our way down to the base of Lantawan Cliff. 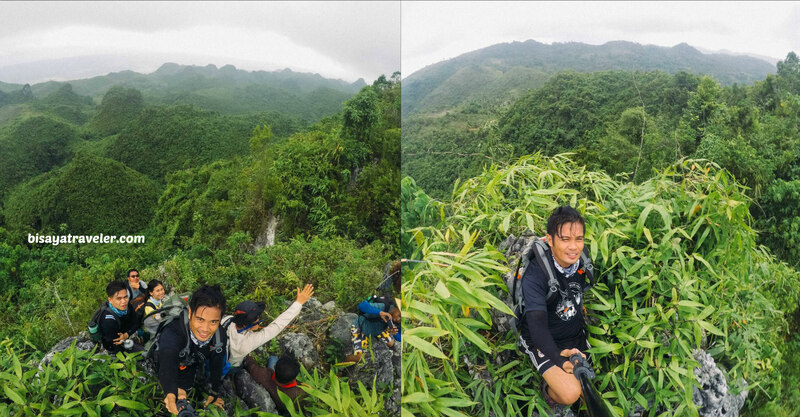 For some of our guides, it was their first time scaling Lantawan Cliff since they were little kids. They say Lantawan Cliff hasn’t been explored by locals for years. And, as I found out later, we were the first group ever to scaled Lantawan Cliff. Yippee! After a couple of group shots, we were escorted by the barangay tanods to Naga-Uling road. We bid farewell to Beth, RJ and ma’am Fe, and took a jeepney ride to Boardwalk Naga. While there, we enjoyed a filling and tasty barbecue dinner and replenished our energy. We, then, called it a day, and went home with a sunnier disposition and cameras filled with outstanding photos. 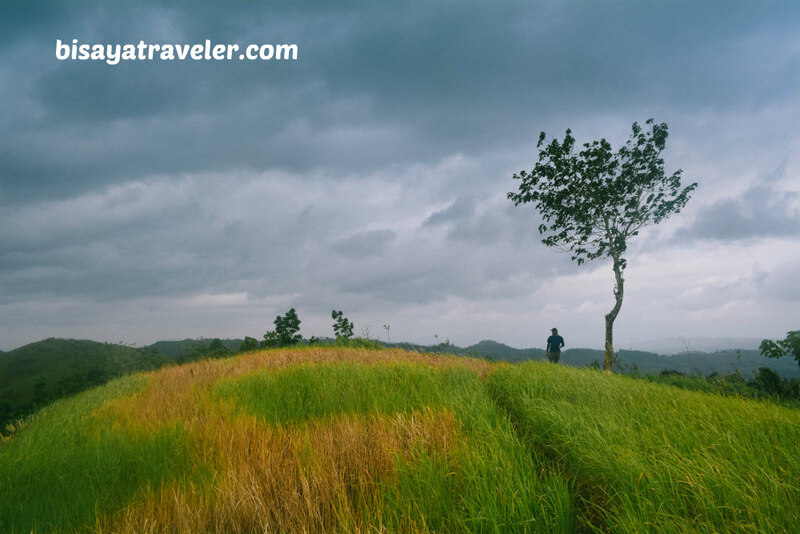 Don’t be a renegade trailblazer for this type of adventure. Coordinate with the barangay officials before making any plans to this cliff. You can reach out to captain Nanding through his mobile number at 0906-769-8503. To get to Tagjaguimit barangay hall, take a bus to Toledo City from South Bus Terminal, and ask the conductor to drop you off at Balirong (fare is PHP 40). Once there, take a habal-habal ride to Tagjaguimit barangay hall (PHP 50 per person). And, by the way, Lantawan Cliff is a work in progress. 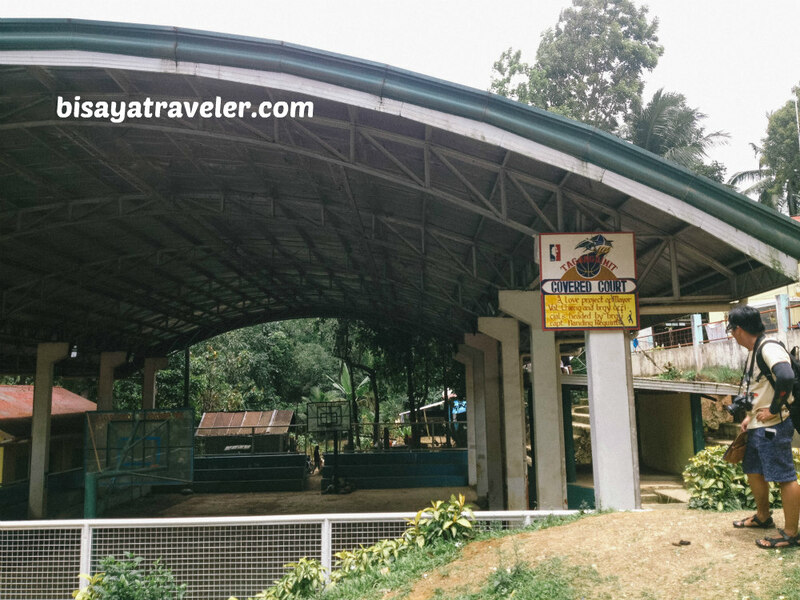 Trust me, the local officials are working hard on making this place an enthralling can’t-miss attraction in Cebu. If you want to visit Lantawan Cliff, I suggest that you go there in the last week of April or in May, 2018. In addition, groups of 12 hikers or less are recommended for this arduous climb. How about Balirong Peak? Just refer to my old post about this picturesque mountain. Wow! This one is indeed another feat. I am intrigued by this place. Hopefully my feet will take me here soon.